Pyrite Gold. 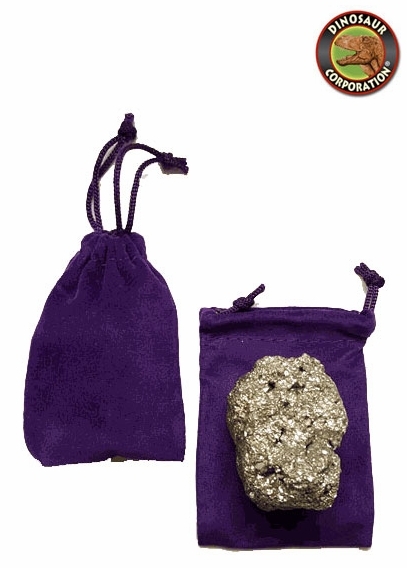 Kids party gold mining favor. Enjoy your birthday party with Pyrite Fools Gold. Packaged in a velvet pouch. * Larger gold chunks can be broken to smaller pieces. Pyrite is the classic "Fool's Gold". There are other shiny brassy yellow minerals, but pyrite is by far the most common and the most often mistaken for gold. Whether it is the golden look or something else, pyrite is a favorite among rock collectors. It can have a beautiful luster and interesting crystals. It is so common in the earth's crust that it is found in almost every possible environment, hence it has a vast number of forms and varieties.